Members of the Georgia Council of Professional Archaeologists are professional archaeologists actively working in the state of Georgia. Membership in GCPA is not a requirement to earn contracts to do archaeology in Georgia. Interested in joining? Find out more on our About Page. This website contains resources for members of GCPA as well as information for the general public about archaeology and resource protection. If you're a website administrator or Board member of GCPA, you can gain access to additional content by logging in. Online dues payment option added! Members of GCPA can now pay their annual dues online with a credit card via Square. Here’s the link. Lets be sure to thank our Sectretary/Treasurer Misty Dunn for setting up and managing this payment option. So save an envelope, save a stamp, stop procrastinating and pay your dues today! Scott Jones examines how easy it is for unscrupulous people to create phony versions of cultural artifacts, and how claims of “authenticated” status might not mean as much as you think. Breaking our usual pattern, SGA and GCPA met in conjunction with SEAC 2000. The well-attended Saturday (11 November) meeting featured tours of the site, a barbeque, and live music. Click here to see the Great Spirits of SEAC photos. Preparing the comestible and libation room Members of the Council came out in force under the leadership of Michelle Martin to prepare the spread for our guests from 7�11 pm on Thursday 9 November. Our spring 2000 meetings were held at the Unicoi Lodge at Unicoi State Park, near Helen in Northeast Georgia. We have a few video-capture images here for those of you with relatively fast internet connections. The Georgia Council of Professional Archaeologists recommends that users employ Mozilla Firefox, Opera, or Apple Safari to view this web page. Click on “Browser Info.” above to find links to these free web browsers. Looting threatens Georgia's heritage—and yours. Find out how you can help. Welcome to the home page of the Georgia Council of Professional Archaeologists. 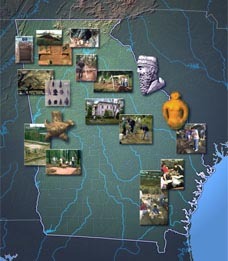 You can find out more about archaeology in Georgia at the Society of Georgia Archaeology page; it's at http://thesga.org. Board Members of the GCPA can log in by clicking below and entering a userID and password.